Japanese Taiko Drummer and Vocalist born in Hyogo, Japan. 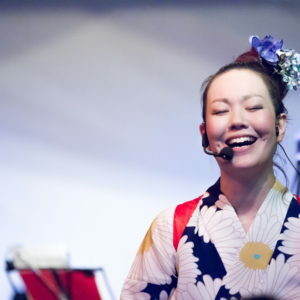 Nami started to play Japanese Taiko Drumming and folk performing arts as a child, and at 10 years old, she went on a performing tour around Japan. Then, Nami learned to master the origin of Kumidaiko, Osuwa-daiko in Nagano. Nami learned Kumi-daiko from Daihachi Oguchi, an ancient stroke style from Mikio Yamamoto. She was selected as a world tour member and performed in the United States, France, and Indonesia. 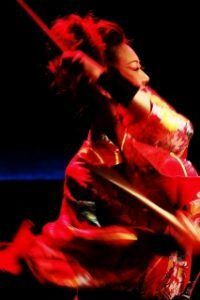 Then, she joined a female Japanese traditional instrunmental group produced by Akira Hayasaka, a novel writer, based in Tokyo and Kanagawa to perform with other Japanese and Chinese traditional instrunment players. In addition, Nami learned Folk Song Drumming from a Folk Song Singer, Shigeri Kizu. She was also a member of “Kizu Shigeri Syacyu”. Not only Nami plays Taiko Drums, but also she writes for school workbook, speciality magazines, and review clitique of CD as a Japanese Taiko Drum specialist. In 2010, Nami was appointed by Agency for Cultural Affairs to be a special lecturer for “ Great Perfoming Art Experiences for Child Project” and she was sent to Hyogo, her hometown. In a following year, Nami founded “Satooto Taiko School Kansai” in her hometown. She researched on Folk Performance Art and created new performing arts to pass on the extinguishing traditional performing arts. Getting supports from Hyogo Prefecture, she produced ”Miki Bujin-daiko” for town revitalize project with public school and local community. Nami also focuses on music in which she discovers and arrange old Shigoto-uta to make new sounding Taiko Drumming song. Those songs are good examples of her exceptional ability to regenerate traditional music from folk music and natural sounds in a new angle. Copyright© 七海Official website , 2019 All Rights Reserved.